Issue #353 was marked as a duplicate of this issue. 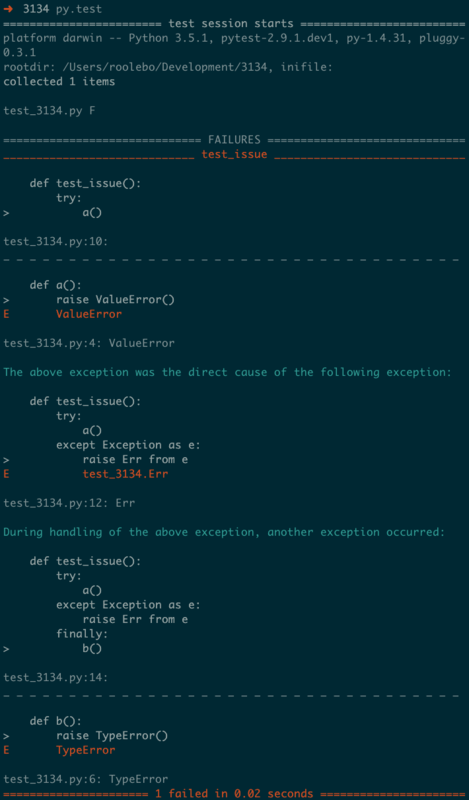 Pytest.raises also does not support this, in that if the inner and outer exceptions are different, and you use pytest.raises(SpecificError), it only matches the outer one. I guess that is correct?? but as mentioned the assert output could be nicer. @pfctdayelise that's indeed the behaviour I'd expect - it's essentially the same thing try/except does as well. After all, the handled exception is never really raised. What is the status of the issue? As far as I understand #103 has been resolved. @roolebo, Thanks! Feel free to ask here or in the mailing list for help. @nicoddemus Thanks! That helped a lot. Is it okay to have such bold separators between elements of an exception chain? Do you have any other advices on visual appearance of the delimiter (colors, etc)? TBH I find that separator a little too disruptive... I would use Python's example and just use empty lines as separator. As far as color goes, I would use something other than red, perhaps Cyan (light blue)? Make sure to add those screenshots to your PR! @nicoddemus Thanks. I still have 7 tests failing :) Most of them are concerned about lack of reprtraceback property and addsection method. Are those actually needed on the ExceptionChainRepr? I rather consider to change the tests than adopt ExceptionChainRepr to existing tests. Yes, because other code (plugins and conftests) depend on that API. I know I do in pytest-qt, and I'm pretty sure pytest-catchlog depends as well. @nicoddemus Alright, thanks for the details. I made common base class with addsection method for both ReprExceptionInfo and ExceptionChainRepr. What about reprtraceback? Should I store reprtraceback of the outermost(newest) exception? Hmm at this point I think it is more productive for us to discuss details over the code itself, so I think it would be a good time to open a PR now.